Fascinating narrative science that explores the next frontier in medicine and genetics through the very personal prism of the children and families gene therapy has touched. Eight-year-old Corey Haas was nearly blind from a hereditary disorder when his sight was restored through a delicate procedure that made medical history. Like something from a science fiction novel, doctors carefully injected viruses bearing healing genes into the DNA of Corey's eyesa few days later, Corey could see, his sight restored by gene therapy. THE FOREVER FIX is the first book to tell the fascinating story of gene therapy: how it works, the science behind it, how patients (mostly children) have been helped and harmed, and how scientists learned from each trial to get one step closer to its immense promise, the promise of a "forever fix," - a cure that, by fixing problems at their genetic root, does not need further surgery or medication. 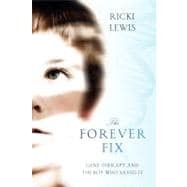 Told through the voices of the children and families who have been the inspiration, experimental subjects, and successes of genetic science, THE FOREVER FIX is compelling and engaging narrative science that tells explores the future of medicine as well as the families and scientists who are breaking new ground every day. When I met nine-year-old Corey Haas, it was hard to believe that just over a year earlier, he had been well on his way to certain blindness. As a geneticist, I’d followed the incredible story of his gene therapy, and as a mom, I was curious about the young man who had made medical history. On a dazzling Saturday morning in early December 2009, I drove forty-five minutes north to meet Nancy, Ethan, and Corey Haas, who live in the Adirondack Park. This spectacular expanse of nature is not a park in the conventional sense, but a vast swath of New York State peppered with small, older houses and log cabins nestled among towering pines, with the occasional noticeably newer vacation home of a downstater. The meandering Hudson River, only a few hundred feet across this far north, snakes through the Haas family’s small town of Hadley, where Corey’s parents grew up. The river is only a block away from their Cape Cod home, flooding their basement in bad snow years. I’d been in the area before, so I found it easily, but some of the reporters coming to interview the family over the past month had grown uneasy when the towering mountains blocked even the most powerful cell phone and GPS signals. But they made it—Ethan gives good directions. Although it took only days for the researchers to realize that Corey’s gene therapy had worked, they had waited a year to publish the results, to be sure the effect lasted and hadn’t caused any problems. They had learned from past gene therapy fiascoes, and also knew Corey’s newfound sight would be big news. And they were right, with Good Morning America setting the slightly hyped tone by describing “revolutionary surgery that could give the gift of sight to the blind.” When the research paper appeared in The Lancet in November, the Haas family traveled to New York City for the very first time, where they made the rounds of the major TV news programs. Despite the intense interest, though, only a few journalists ventured north to meet Corey on his own turf. The morning of my visit, the scent of the season’s first snowfall was in the air. In the Adirondacks, you don’t need a weatherman to know which way the wind blows, to quote Bob Dylan. You just have to watch the squirrels. I had to hopscotch around them as I walked up to the Haases’ front door, my hands laden with my laptop, books, and a large box. The squirrels scurried everywhere, grabbing and stashing acorns in the heart-shaped crevices at the bases of the tree trunks, occasionally dashing the wrong way and bashing into the large picture window in the living room that reached almost to ground level. The squirrels knew snow was coming. When Corey opened the door, our eyes went first to the scampering squirrels, then to each other. He gave me a huge grin, his blue eyes dancing behind thick glasses. He took my leg and guided me to a coffee table, where I dropped my armload. As Ethan and Nancy introduced themselves, Corey began rummaging around the rocks and fossils in the box, a subset of the collection I’d begun at his age. Knowing he’d only recently been legally blind, I knelt down and tried to show him how to feel the indentations of the trilobites and brachiopods. But he proudly refused all assistance, peering closely at each fossil, as I had at his age, slowly turning each one to see what different angles might reveal. I looked around. The décor was a welcoming blue and white, the rooms unusually tidy for the home of a small boy. His toys were neatly aligned on low shelves and stacked in corners, without the clutter that continually grows in my own home. But perhaps this was a habit from the time when Corey had to memorize where every single item in a room was in order to move about. Above the couch where I sat and typed as the family talked, a shelf held a dozen of Nancy’s 110-plus dolls. These were the special ones, the others inhabiting closets and a storage room, packed in with Nancy’s scrapbook collection. The other walls held what can only be described as a gallery of Coreys. My favorite was a photo of Corey at about one year old, with a broad smile and thick glasses, “Corey” stitched in needlepoint below, framed in red. The earliest photo on the walls, taken when Nancy and Ethan had yet to learn that Corey had inherited an eye disease, showed baby Corey stuffed into railroad overalls, a yellow shirt, and white socks, looking off to the side as if he’d rather be anywhere else. A wall in the dining room had the words live, laugh, and love spelled out in wood, with three photos beneath each—all of the resident celebrity, Corey. As Ethan talked and sorted copies of medical reports to give me, Corey jumped up every few minutes to show his mother a rock. I glanced at them, trying, but failing, to imagine this energizer bunny of a boy stumbling around the same living room, crashing into the furniture like the squirrels outside careening from tree to tree. But that day he rocketed around the cozy living room with ease. He showed me his handheld Nintendo and how to extract a fart noise from a container of Silly Putty–like goop, and then he asked me to name the minerals in his rocks. Periodically he’d demonstrate the hardest part of the gene therapy for him—lying ramrod still on his back. I noted subtle signs of what the family had been through. Once in a while Corey would lose his footing briefly, and Nancy’s arm would instantaneously zap out to steady him, sometimes hugging him close. He didn’t squirm away. Corey’s independence was still new to all three of them. For years he could see only shadows, and in dim light, nothing at all. On September 20, 2008, two days before Corey’s eighth birthday, and fifteen months before I met him, the Haas family had traveled to Children’s Hospital of Philadelphia—CHOP. That week, Corey underwent a battery of what had become familiar tests, plus a few new ones, and on Thursday morning was finally prepped for the procedure. Then, as Corey lay anesthetized, the eye surgeon Al Maguire snipped open a tiny flap in the left eye, the worse one, and carefully injected 48 billion doctored viruses into a tiny space just above a thin layer of colored cells that resembled patterned bathroom tile. This space and the layer of cells hug the rods and cones at the back of the eye. Corey’s colored cells weren’t doing their job of nourishing the precious rods and cones, which are called photoreceptors because they capture incoming light. His rods and cones had been slowly starving for years, gradually becoming too weak to send light signals to his brain to paint an image. As a result, before Corey lay down on the operating table, he saw only blurry, dark shapes. But that would change—sooner than anyone had even dared imagine. Although it took only days for the researchers to realize that Corey’s gene therapy had worked, they had waited a year to publish the results, to be sure the effect lasted and hadn’t caused any problems. They had learned from past gene therapy fiascoes, and also knew Corey’s newfound sight would be big news. And they were right, withGood Morning Americasetting the slightly hyped tone by describing “revolutionary surgery that could give the gift of sight to the blind.” When the research paper appeared inThe Lancetin November, the Haas family traveled to New York City for the very first time, where they made the rounds of the major TV news programs. Despite the intense interest, though, only a few journalists ventured north to meet Corey on his own turf. I looked around. The décor was a welcoming blue and white, the rooms unusually tidy for the home of a small boy. His toys were neatly aligned on low shelves and stacked in corners, without the clutter that continually grows in my own home. But perhaps this was a habit from the time when Corey had to memorize where every single item in a room was in order to move about. Above the couch where I sat and typed as the family talked, a shelf held a dozen of Nancy’s 110-plus dolls. These were the special ones, the others inhabiting closets and a storage room, packed in with Nancy’s scrapbook collection. The other walls held what can only be described as a gallery of Coreys. My favorite was a photo of Corey at about one year old, with a broad smile and thick glasses, “Corey” stitched in needlepoint below, framed in red. The earliest photo on the walls, taken when Nancy and Ethan had yet to learn that Corey had inherited an eye disease, showed baby Corey stuffed into railroad overalls, a yellow shirt, and white socks, looking off to the side as if he’d rather be anywhere else. A wall in the dining room had the wordslive,laugh, andlovespelled out in wood, with three photos beneath each—all of the resident celebrity, Corey.